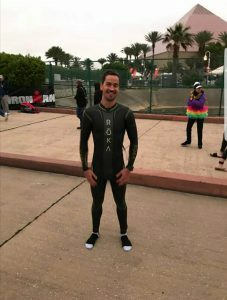 Where do I even begin with my first ever Ironman 70.3 race. To start with, I committed to this race since Dec 2017 and I have been training ever since with this as my main race goal. Based on my online data that has been saved, within the four months lead up, more than 152 hrs or over 9,000 minutes of strict training has been put into preparing for the this race and the end result is that it was worth every second and every sweat. 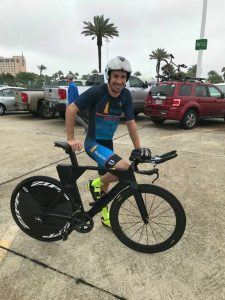 The Texas Ironman 70.3 event was by far my biggest event to date with close to 2,300 competitors from around the world and ranging from professional world champions to age group athletes. I knew what I was in for and my work was cut out for me. Going into the event I was feeling great with no expectations as I have never done a race to this distance and was tremendously excited. The entire week leading up to the race, weather conditions were looking like it was going to be the best year yet. With cool temperatures expected at 20 ºC and low winds. One thing that I quickly realized with Galveston Texas, is that the weather conditions can change at the blink of an eye. The evening before the race, some unexpected weather moved in and dropped the temperatures down to 8 ºC and colder. The morning of the race came and conditions stayed the same. High temps of 8 ºC with winds coming from the east of 16-25 KM/h which would be a head and tail wind for the bike making it even more challenging. To put it simply, before the race started, I was under three layers of clothes trying to warm up. We trinis were not made for the cold. The event kicked off at 7.00 am on Sunday April 8th with the first athlete waves starting with the professionals. This then continued for almost 90 mins with wave starts 4 mins apart to separate the different age groups. My swim wave started at 7.52 am and I got on my way. The swim was actually not that bad as I was wearing a wetsuit that was keeping me warm. My main problem that I faced with the swim, was the sheer number of people in the water and having a harder than usual time making my way around the course without bumping into other swimmers. I finished my 1.2 mile swim in a time of 33 mins and in the top quarter of my age group. From the swim to the ride. Once my wet suit was off, I quickly felt the cold temperatures as I got onto my bike. Within the first few miles I definitely knew that the cold was going to be a major factor. The first 27.5 miles with a tail wind blowing a bit on my back went well, except my hands becoming numb and frozen to say the least. The clouds then decided it wasnt cold enough and figured some nice rain should be included. At this point my hands were so cold I was not able to grab my water bottle and drink as my fingers were not able to move freely. Lets just say I held onto my handle bars and pushed through the remaining 27.5 miles with 20 km/h head winds with great pain. Thoughts rushed through my head constantly as to why was I even doing this and put my body through this. lol. But I got through the 55 mile ride in a time of 2 hrs 26 mins moving up over 10 positions in my age group. Now just the final half marathon or 13.2 miles to run. Going into the event, I was most nervous for this leg, but once I got going, and my body warmed up a bit and I got to work. With thousands of supports lining the entire run course, screams and cheers could be heard every second. With a great support team present of my wife, parents, and a few other close friends, they kept me going. My pace never slowed down much for the entire run course and I was surprising myself. I stopped the clock for the run in 1hr 31 mins and feeling great. In the end, I completed my first ever Ironman 70.3 in a time of 4hrs 34 mins 52 seconds. With this time, out of 2,217 athletes, I placed 129th and 16th in my age group out of 194 athletes. This overall finish also includes almost 60 professional athletes. With this result I am super pleased and honestly believe that I have a lot of room for improvements and with some better conditions I can drop this time down quite a bit. I really do enjoy this Ironman 70.3 distance and believe I am better suited to this distance than the standard Olympic distance and will be aiming to compete in a few more of these events. With this in mind, my goal for next year has already been set to qualify for the Ironman 70.3 World Championships 2019. (Please take note Ben haha) Will have to choose the right event to try and qualify as these events are spread around the world and sometimes can be financially hard to get to with air travel, accommodation, entry ect. One thing that I did realize after competing in this event was the sheer amount of support that I was receiving from Trinidad and around the world. The amount of people that followed the race online, through apps and the hundreds of messages received after was just so overwhelming and motivating. Made me feel very proud and only continues to push me further. Training starts back next week as I will be heading to Miami to compete in the Caribbean Triathlon Age Group Championships on May 20th. After this will be the T&T National Triathlon Champs in Tobago on June 9th. Posted in Client Race Reports, Training Blog.